Dandeli, also known as the adventure hub of Karnataka, is famous for being the perfect vacation spot for nature and adventure lovers. Dandeli lies on the banks of the River Kali in Northern Karnataka, around 75 km from Hubli. The picturesque town is surrounded by deciduous forests and is known for the variety of flora and fauna that call the forests their home. Dandeli’s origins go back to the 1930s when most of the populace worked in the government sawmills and the forest department. The settlement developed into an industrial community, now called Old Dandeli, with the establishment of accomplished companies such as the Indian Saw Mill, West-Coast Paper Mill, and the Indian Plywood Mill, among others. There is an intriguing legend about how Dandeli got its name. Legends speak of a person called Dandelappa, after whom Dandeli is rumored to have been named, who was employed at the mansion of the Mirashi landlords. In due course of time, a certain Mirashi lady fell in love with Dandelappa, who rejected her proposal to save his master’s dishonor. Humiliated on being jilted so, the lady accused Dandelappa of having misbehaved with her and promptly told this to her brothers. Enraged, the landlords had Dandelappa killed and then placed his remains at different places. Eventually, as a mark of respect, the area, and the surrounding regions came to be known as Dandeli. Dandeli lies at an altitude of 1,552 ft. above sea level. Dandeli receives a lot of rainfall between August and November when the temperatures range from 18 to 30 degrees Celsius. Summer temperatures are around 23-37 degrees Celsius while winter temperatures drop to as low as 16-28 degrees Celsius. The shoulder season of September is perfect for road trips in the region. 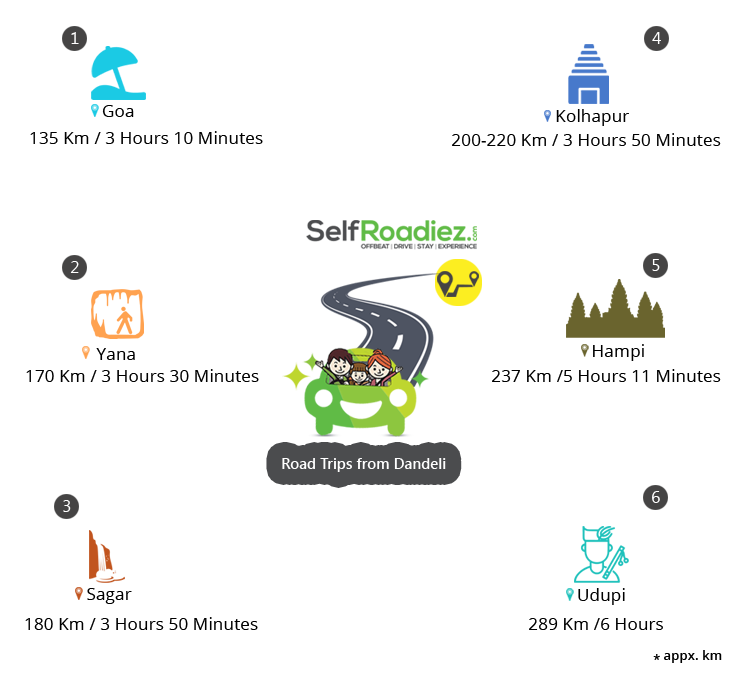 The nearest airport to Dandeli is around 77 km away in Hubli. Dandeli currently has no railway station, although the Ambewadi railway station is being developed to boost tourism in the region. The nearest railway station is in Hubli-Dharwad. Travelers can retreat to the sun-kissed beaches of Goa where the combination of sun, sea, sand, and spices does wonders for the soul. A tiny slice on India’s western coast, Goa brings together the Konkani and Portuguese cultures in an effusive way. Attractions include the centuries-old and religiously important churches and convents such as the Basilica of Bom Jesus, the village set up of Ancestral Goa, beaches such as Anjuna, Vagator, Colva and Baga, lighthouses and forts and the flea markets where one can haggle away to glory. Around 170 km from Dandeli lies the mystical village of Yana that is steeped in legend. Yana’s main attractions are two humongous solid black crystalline limestone rock ridges (Bhairaveshwara and Mohini shikhara). Beneath the Bhairaveshwara shikhara is a cave temple famous for a ‘Swayambhu Linga’ (self-manifested representation of Lord Shiva). Sagara is a town in Karnataka that is known for its proximity to places of historical importance and with natural beauty. It lies northeast of the Sharavati Wildlife Sanctuary. Places to see include the popular Jog Falls, the Sharavati Wildlife Sanctuary, the Linganamakki Dam, the Dabbe Falls, and the towns of Honnemaradu and Holebaagilu. Kolhapur (a.k.a. Colapore) is a former princely state and administrative seat of the Maratha Empire, and one of the most important cities in the state of Maharashtra. Places of interest include the Mahalakshmi temple, Rankala Lake, Bhavani Mandap and the Siddhagiri Gramjivan Museum. Hampi is an ancient village in the south Indian state of Karnataka. It’s dotted with numerous ruined temple complexes from the Vijayanagara Empire. Udupi is a city in the southwest Indian state of Karnataka. It’s known for its Hindu temples, including the huge, 13th-century Sri Krishna Temple, which houses a statue of Lord Krishna and attracts many pilgrims. Nearby, the ancient Anantheshwara Temple is dedicated to the god Shiva. 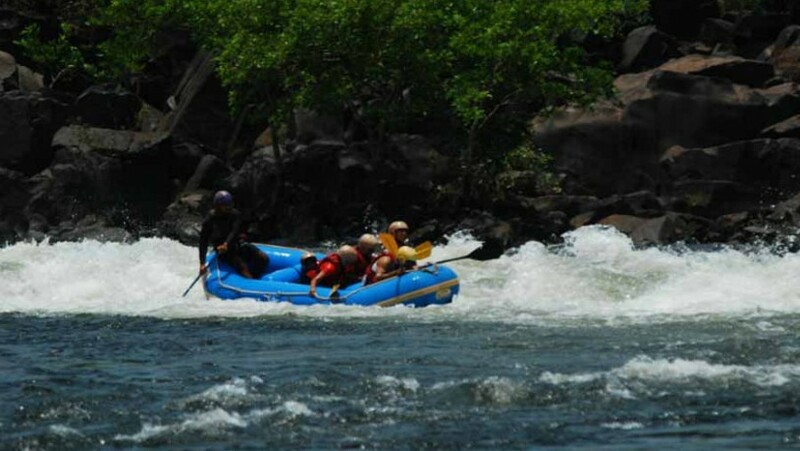 Dandeli is best known for the plethora of adventure activities. The River Kali’s Class 3 rapids offer unforgettable canoeing, kayaking and white water rafting experiences for thrill seekers. On terra firma, adventure lovers can indulge in mountain biking, cycling and overland treks with guides. Wildlife enthusiasts are bound to have the time of their lives in the Dandeli Wildlife Sanctuary and Anshi National Park which offers glimpses of Malabar squirrels, bison, black panthers, and maybe even king cobras and iguanas. Culture and history aficionados can visit some of the unique tribes in Dandeli and head to the limestone Kavala caves. Trekking and viewing lovers can spy some gorgeous views atop Shiroli peak and Ganeshgudi hill or watch the waters at Navjhari falls and Syntheri rocks. Stay at one of the many rustic homestays in Dandeli to experience the town at its natural best. Since Dandeli is a place of nature and adventure, accommodation is either in jungle stays or homestays, most of them on the banks of the Kali River. Old Magazine house at an altitude of 1800 ft above sea level, is a rustic boarding that does not believe in too many frills when it comes to accommodation but ensures comfort and basic amenities. It is the perfect getaway to be by yourself and to appreciate the little creatures of nature. You can choose between the ethnic cottages and dormitories resembling tree houses because of the elevation their log bases provide for your stay. Dandeli is the perfect blend of history, culture, and adventure. While traveling to Dandeli, the scenery is gorgeous and the navigator is advised to be ready with the camera to capture some great clicks, especially in the monsoon season. Overall, the roads in Karnataka are great and travelers shall have no problems reaching Dandeli. If one is looking for nature and adventure together in a picturesque place, then Dandeli is the place for a holiday!